Lokalise has a powerful built-in translation memory, that is shared between all team projects and members. Lokalise has a powerful built-in translation memory, that is shared between all team projects and members. Everything that you (or any other team members) type in the editor, upload or set via API is being saved for later use in translation memory automatically. Once a translator has completed translating a key from English to Russian (for example), Lokalise would automatically save this translation option to TM (Translation Memory). It shows up in the inline suggestions automatically, in case source matches target from 50% and up. Bring up TM widget in the editor by pressing Ctrl/Cmd-G. Exact match - restricts the search results to 100% matches. Search target - allows you to search in the target language. If disabled, the search is performed in the source language. 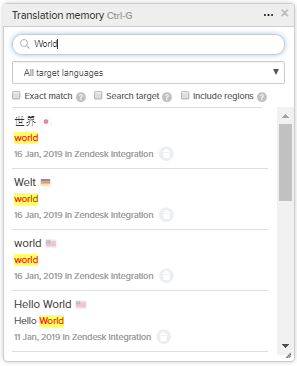 Include regions - Enable to include all regions available for the selected target language (and source language if in bilingual mode). Team administrators are able to manage translation memory (.tmx) files in the team settings under the Translation memory tab. Project administrators can select an exact translation memory to be used in a particular project. In case the project requires more than one TM they can adjust TM priority by dragging boxes in the necessary order. Also, team admins have to select which translation memory will be updated with new translations from the project. Note: This feature is available starting from the Pro plan.